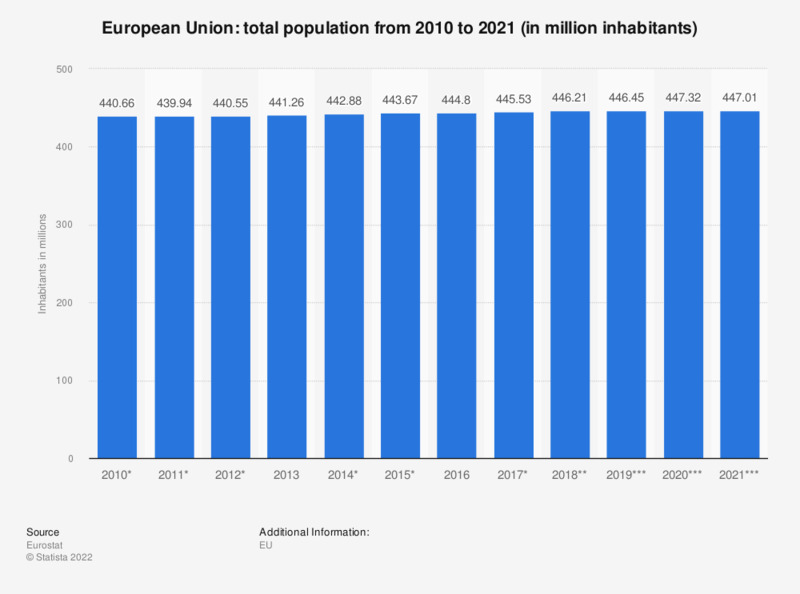 This statistic shows the total population of the European Union from 2008 to 2018. The population is based on data from the most recent census adjusted by the components of population change produced since the last census, or based on population registers. At the beginning of 2013, the total population of the European Union amounted to approximately 505.17 million inhabitants. See figures for the total population by continent here. The global population is rapidly increasing. Between 1990 and 2015, the global population has increased by around 2 billion people, and it is estimated to have increased by another 1 billion people by 2030. Asia is the continent in the world with the largest population, followed by Africa and Europe. Asia has the two most populous nations in the world: China and India. In 2014, the combined population in China and India amounted to more than 2.6 billion people. The total population in Europe is around 741 million people. As of 2014, about 10.2 percent of the global population lived in Europe. Europe is the continent with the second highest life expectancy at birth in the world. Born in 2013, the average European was estimated to live for around 78 years. Stable economies as well as developing and emerging markets in Europe provide for good living conditions for foreign nationals; seven of the top twenty countries in the world with the largest gross domestic product in 2015 are located in Europe. **As of January 1 of the respective year or, in some cases, as of December 31 of the previous year. The figures for all depicted years refer to the current EU member states (EU 28), i.e. including those which were not a member previously.